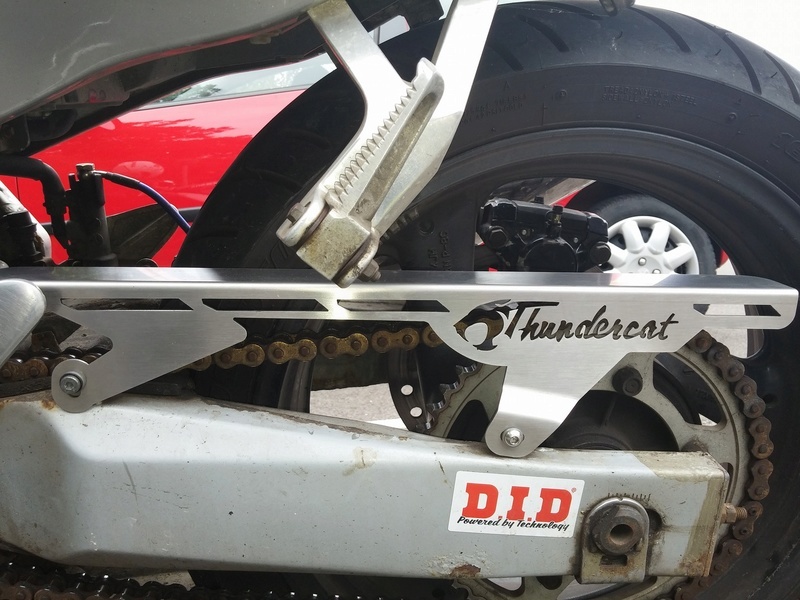 So got a little naughty and bought myself a new chain guard for the Tcat (Was my 30th so I'm aloud to spend a little money) next is a custom mud guard thingie. Happy belated 30th birthday. Chain guard looks good, not to be a damper on it, hope it not a mission to keep it clean. Nice. That's some precision cutting, happy 30th birthday. @Ondurin wrote: .. next is a custom mud guard thingie. That's a nice hugger! I'm going to use mine as a template and create a custom one from fiber glass. Would be a shame to destroy that red one. I ummed and ahhed over one of them chain guards for years. I was gonna get one and have it powder coated. Wish I'd got one now. Much nicer than the standard one. Sorry for the most delayed reply every, but moved house and work craziness has been exhausting. It's actually very easy to keep clean. I might get it powder coated when I take my swingarm for a sandblast.